ATHENA Young Professional Award finalists discuss finding success and responding to adversity. Teachers and Vista College Prep CEO Julia Meyerson anticipated eagerly the arrival of the school’s first class back in 2013. When only one third of the expected students showed up that day, Meyerson knew the teachers were looking to her to determine why the students had missed class and craft a solution. “We received over 90 applications for the first day of school and 33 students show up. There were more adults than students in the building and I was terrified inside,” Meyerson shared during the Valley Young Professionals breakfast Jan. 24. 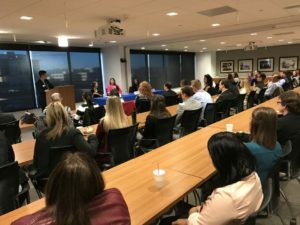 Meyerson and other ATHENA Young Professional finalists discussed finding success and responding to adversity during the event. Meyerson determined the issue was fixable. The missing students just needed a ride. Vanessa Valenzuela Erickson, 2016 ATHENA Young Professional Award finalist, recalled taking a job with Teach For America (TFA) early in her career against the advice of friends and family. Despite her family living in the failing Roosevelt School District, Erickson attended school in the Kyrene School District, where she received a quality education. Now, she values the time she spent teaching in the Roosevelt School District with TFA, which provided her an expanded outlook on education in Arizona. “This is the school district I came back to teach in and it was a risk, but it really paid off because it grounded me in new perspectives that I have carried to my career and community,” Erickson said. As a strong supporter of taking risks to achieve success, Christy Moore, president and CEO of Valley Leadership and the 2013 ATHENA Young Professional Award recipient, leads by example. “I am notorious for going for jobs that I am not qualified for and that I get to grow into,” Moore said. Moore became the first executive director for the Foundation for an Independent Tomorrow at 19 and moved a few years later from Las Vegas to open the first domestic violence shelter in northern Pinal County despite not knowing much about it. Her secret? Surrounding herself with experienced people. “I knew nothing about violence against women except for my own trails so I quickly surrounded myself with people far more wise in that space who taught me and together we created shelter and housing,” Moore said. Moore also advises other professionals to block out specific time on their work calendars to approach specific tasks. During “Christy time,” she closes her office door to minimize distractions and focuses on what she wants to accomplish. Join the Valley Young Professionals on Thursday, Feb. 16 for a tour of Danzeisen Dairy, a local, family-run dairy farm operating in Phoenix for more than 50 years. During the tour, VYP members will have an opportunity to see the behind-the-scenes operations including a short ride to the dairy farm to see the cows as well as the composting operation. Register today!